As we have fished so many ocean species to the edge of extinction, we have to ask ourselves, is there a hopeful ending to this story? Are fisheries exhaustible? That was the question posed at the Great International Fisheries Exhibition in 1883. The answer then was, no. Even today, the answer still seems to be know despite all the evidence to the contrary. Cod, wolffish, halibut, haddock, swordfish, marlin, skate and the might bluefin tuna populations have been decimated. By any reasonable calculation, the stocks of large predatory fish have declined 90% since the 1950's. That is indeed a remarkable accomplishment. And to think, we have some of the most sophisticated technology to measure fish stocks and total catch, but still nothing is done. We have an organization in ICCAT, who is charged with managing the catch of bluefin tuna. "In 2008, ICCAT scientists recommended that the bluefin catch in the eastern Atlantic and the Mediterranean be limited to between eighty-five hundred and fifteen thousand tons. ICCAT instead adopted a quota of twenty-two thousand tons. That same year, a panel of independent reviewers, hired by the commission to assess its performance, observed that ICCAT “is widely regarded as an international disgrace.” Carl Safina, the noted marine conservationist, has nicknamed the group the International Conspiracy to Catch All the Tunas. Where does the madness end? In 1964, the annual global catch was 50 million tons. In 1967, the U.S. Interior Dept. estimated the catch could be increased to 2 billion tons. That is a 40 fold increase. The total world catch topped out at 85 million tons in the 80's. What planet do those charged with managing ocean species live on? In the past 20 years, we have seen global catch decline year after year. Estimates indicate we appear to be loosing 500,000 tons a year as less fish are caught. One day, your children will tell stories to their children about the stories you used to tell them about great fish being caught at sea. Now, you are probably thinking, BS, don't be so alarmist. The facts speak for themselves. Ask yourself this question, do you care or do you see it as someone else's problem? Be responsible fishermen and take a stand. 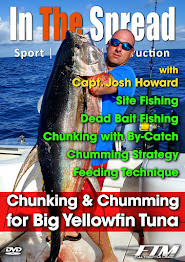 We need to start now to rebuild fish stocks, so we can continue to enjoy the sport we all love so much. I am usually do not get real excited about the latest tech gadgets, but this super cool little device is worth a look. No more business cards or the need to gather cards or scribble contact info on scraps of paper. I am going to buy a few of these and pass them around to my friends. This is a brilliant idea. You just have to love ingenuity! The art of high impact story telling is a craft Stephen Low has mastered. His films are some of the most intense real time journeys you have ever seen. You can really feel like you are in the moment. If you are in the business of film making or video production and have not had the chance to experience his work, please take the time. It will be so worth it. This trailer for the film "Super Speedway" is amazing. Although the film came out a while back, it is nonetheless stunning visually. The audio grit just draws you in. All of my auto enthusiasts friends were stunned by the camera work. Of course this a large format film shot with very expensive equipment. The footage that you really want to key in on is that of racing legend Mario Andretti and his son Michael as they race with cameras mounted on their cars. The raw speed and intensity of screaming down the track at well over 200 mph is gripping. This is a one off production that auto enthusiasts will not tire of watching. These are two different trailers. Both are equally brilliant. Watch the first one in 720p, amazing! Food for thought this morning. After you launch your brand, you are only as good as the product and performance you deliver, and the brand promise has to be lived up to. If the promise has been very substantial and the performance has been average, that’s going to put you in a bigger hole than if the promise was modest and the performance has been average. With that in mind, why do I see so many folks in positions of controlling the marketing and brand strategy, as well as it's implementation, with absolutely no idea what they are doing? The silence is deafening. Even worse, you cannot even convince them to do what is in their best interest because they do not know what their interest is to begin with. If you have ineffective or inefficient people in positions that impact your brand, get rid of them. The economic and business environment we find ourselves in today is the perfect excuse to ease your burden and bring in new talent. Keep the ideas flowing. It was early last year and I was pitching a film based marketing plan to a business. Full Throttle Media's idea was to shoot a longer format feature segment and then edit down to multiple 2-3 minute clips for promotional purposes. The long format would be used for streaming, download, trade shows or more interactive sales situations and the short disseminated through broadcast means online. Any way, they had their hired content expert on site and all she could say was “Short format is the only thing that works. It has to be less than 30 seconds.” Sigh! I was offering direct access to the audience they most needed by means of a multimedia production communicated across multiple platforms and she was focused on print advertising. Needless to say, they could not make a decision on my proposal and eventually ended up doing nothing. Where are they today? Nobody knows and the content expert was fired. Gee, I wonder why. This company is still in business struggling to position their brand with their target consumer. What I mean by nobody knows is that they spent "hundreds of thousands" of dollars listening to the content expert and got butkus. They are no more known today than they were a year and a half ago. A new report from eMarketer shows continued growth in US online video viewers over the last year and projections for further growth going forward. The kernel in this report reveals that while online video viewership was increasing rapidly, the streaming and downloading of full length productions was experiencing even more dramatic growth. Internet users are moving beyond snack size clips and embracing full length features online. Well, I have another appointment with these guys. A recent article in a local Costa Rican newspaper got me thinking about just how irresponsible so many are when it comes to our oceans. Don't for a second get me wrong, I love making money and begrudge no person for pursuing wealth and fame, but when that profit comes at the expense of simple conservation principles I cringe. This article detailed the plight of several Taiwanese fishermen that were being held captive on a Costa Rican registered fishing vessel and forced to haul sharks out of the sea for their fins. If I have said this once, I have said it to the point of exhaustion, we are in a race to catch the last fish. Now, I could go into detail about the cramped harsh conditions the workers were kept in and the 20 hour work days, but my focus is on the reckless and idiotic practice of shark finning. 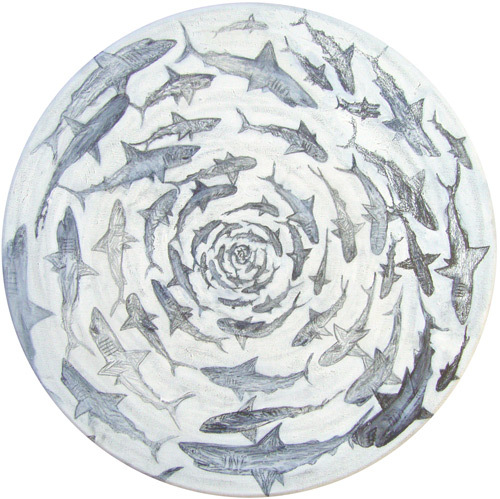 As the world's demand for sharks continues to grow, shark populations are plummeting. Sharks are particularly vulnerable to overfishing because they grow slowly, are late to mature and produce relatively few young. 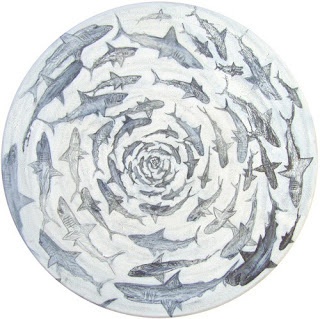 Currently more than a fifth of shark species are listed as threatened with extinction. Shark finning, huh! What the hell kind of practice is that? Finning consists of hauling sharks out of the water, slicing just their fins off and then tossing their bodies, often still alive, overboard to rot in the water. 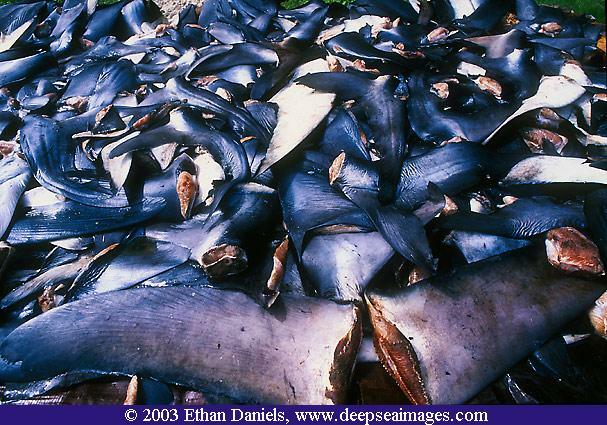 The fins are then sold to Asian markets for use in “delicacies” like shark fin soup. Why would anybody want to eat a sharks fin? Because, it gives you virility, or so the story goes. This is a horrible and destructive fishing technique that has been going on for years and you would think it would be illegal in most civilized countries. But, not in Costa Rica, where all things are green and the people love nature. I bet most people do not even know this savage practice takes place in this country. Here is one caveat, while selling shark fins is not illegal in Costa Rica, removing the appendages before docking is prohibited. Ohhhh, that's so much better. What, are you kidding me? When the fins are worth so much more than the bodies, finners prefer to cut the fins off at sea and dump the carcass back into the ocean. You know, who needs those pesky shark bodies taking up valuable space in the cargo hold. Even though it is illegal to land fins without the shark in Costa Rica, there is little or no enforcement to worry about. I have witnessed first hand fishermen hauling basket after basket of just fins onto the beach. Odd you might think. Not really! The Asian market where these fins are sold has no regard for the oceans or how many thousands of tons of sharks are killed each year for their fins. “The Ministry of the Environment, Energy and Telecommunications has said that the Taiwanese boats had all the necessary permits to fish for sharks in Costa Rican waters and that, as far as fishing is concerned, the owners of the ships did not commit any crimes.” This quote is taken from Mike McDonald at the Tico Times. They had the proper permits and no crimes were committed. How sad this commentary is for the world. And the more curious aspect of the story is that the enslaved fishermen tell a different story. They say they were hauling in fish after fish and slicing off their fins while at sea. Huh, who should we believe? Whether this takes place in Costa Rica or any other country, practices like this must stop. We are emptying our oceans at an ever increasing and alarming rate. Metric tons of sharks, tuna, swordfish, marlin and so many more species are being harvested to feed our appetites for fish. This is unsustainable. How many excuses can we come up with for why we should continue with the status quo? Large scale international commercial fishing operations are a scourge to our planet. Maybe one day you won't be able to buy shark fin soup or a tuna steak. What then? Here is another nicely produced fly fishing film that demonstrates you do not need a well known host to capture the audience. Fishing enthusiasts are over the format that injects the "well known" angler or captain into a local scene where the entire film is about them and not the place. You really have to understand that todays audience wants to see the destination for what it is and listen to the "guy" who has spent a lifetime getting to know the waters intimately. Make it personal. The idea is for the viewer to feel as though they have been welcomed into the living room of the local expert to share in the knowledge and experience accumulated over years. Great job Costa del Mar. You have another winner on your hands with "Currents of Belize". A clip from Full Throttle Media's "Big Game Legends" film. This is a historical documentary about the development of big game fishing and tackle around the world. This footage was shot on 16 mm and edited for the express purpose of achieving an edgier effect. The fishing is taking place on the Great Barrier Reef. The guys at On the Fly in New Zealand are doing some incredible fishing on the other side of the planet from where I am. You have to get down there and experience some of these goods. Setting new standards for innovation, Vision Research, a leading manufacturer of digital high speed imaging systems, proudly unveils the Phantom Flex, the company’s next generation, high-speed camera for the digital cinema market. Redefining what’s possible when it comes to high-speed imaging, the Phantom Flex offers industry-leading flexibility, allowing users to fine tune and adapt the camera to their changing needs and to deliver impressive slow-motion images in just about any application or environment. For situations that demand the ultimate in resolution, the Phantom Flex boasts a specially engineered four mega-pixel color CMOS sensor which offers a maximum resolution of 2560x1600. When set to Standard Mode, users can enjoy a maximum recording speed of 1,560 frames-per-second (fps) at the camera’s maximum four mega pixel resolution. Higher recording speeds can also be achieved by reducing the camera’s resolution. For example, when used in full-HD resolution (1920x1080), the Phantom Flex offers a maximum recording speed of 2,800 frames-per-second. When reduced to 720p HD resolution (1280x720), the Phantom Flex offers a maximum recording speed of 6,100 fps. The camera can go even faster, recording at 13,000 fps at 640x480. In addition to delivering impressive results for high-speed imaging, the Phantom Flex can also be used to record at more traditional speeds with frame rates starting as low as 5 fps, further adding to the versatility of the camera system. Users will also benefit from the camera’s Phantom HQ shooting mode, a high performance setting which yields the ultimate in image quality. A step-up from Standard Mode, Phantom HQ Mode employs Vision Research’s proprietary image enhancement technology. An unprecedented achievement in digital high-speed cameras, Phantom HQ Mode ensures stable blacks, low noise, higher dynamic range and repeatable shots over the full range of supported resolutions, frame rates, and temperatures, all without the need to conduct pre-shot black references. When set to Phantom HQ Mode, the Flex trades speed for enhanced image quality; however, the camera still offers impressive maximum recording speeds of 780 fps at 2560x1600, 1,390 fps at 1920x1080, and 3,000 fps at 1280x720. With the purchase of any Phantom Flex digital high-speed camera, Vision Research provides a three-year service protection program, which covers any needed repair as well as software and firmware updates. Vision Research is also offering an aggressive technology protection program that gives current Phantom camera owners to the ability to trade-in their used camera to experience the new Phantom Flex at a discounted rate. Depending on the condition and age of the used Phantom camera, customers can receive a trade-in credit towards the purchase of a Phantom Flex. Thanks to this unprecedented program, loyal Vision Research customers can maximize their investment and stay at the forefront of the continually advancing, state-of-the art high-speed imaging technologies offered by the company.